In reading GotQuestions assertions about partial preterism, (https://www.gotquestions.org/partial-preterism.html), it confuses me. Here's an outtake: "The partial preterist viewpoint leads to a belief in amillenialism (or post-millenialism) and is associated with covenant theology. Of course, it rejects dispensationalism. But its main problem is its inconsistent hermeneutic and its allegorizing of many biblical prophecies that are better understood literally. While partial preterism is within the scope of orthodoxy, it is not the majority view among Christians today." And how does this first century fulfillment integrate with the last few chapters of Revelation? A preterist outline of perceived trajectory events that include revelation and other Scriptures would be most helpful. While I agree that the beast and Rome, in the first century, seems to match up well, other parts I'm uncertain of. 1. "inconsistent hermeneutic" is nothing more than name calling. I think you already noticed that Kenneth Gentry's hermeneutic is much more consistent than the nonsense that comes out of the dispensationalist camp regarding the explicit timing of Jesus, John, and Daniel in Mat 24:34, Rev 1:1-3, and the 490 years of Daniel 9. 2. allegorizing is code for interpreting John's symbolic vision in Revelation as a ... wait for it ... symbolic vision. Those who try to deny the symbolic nature of John's vision are ignoring the number of times in Revelation that John takes time to define the symbolic language. 3. Preterism may not be the majority view among Evangelicals today, but Amillenialism is the majority position among Christians throughout the 2000 year history of the Church. Ironically dispensationalism has only been around for less than 200 years... that's less than 10% of the history of the Church. So I don't think dispensationalists have much of a leg to stand on when they are talking about "minority positions". Preterism is consistent with Amillenialism which has been the historic majority position of the Church for 2000 years. If we look at the time indicators explicitly given in Revelation I don't think we should expect the portions of Revelation that take place after "1000 years" to be part of what John expected to take place soon. If we look at John's explicit time indicators in Revelation, he expected the events described in Rev 5-19 to take place "soon". Please put in brackets, the Scriptural references besides each step of the outline. Here's my basic personal outline with references. I don't claim perfect knowledge, but these are key passages for me and represent my current operating model. And I may or may not agree with the basic premise of the book. I don't know if it is challenging Partial Preterism or Full Preterism. As I noted in a previous post I believe that fully realized eschatology (full/hyper Preterism) is unScriptural. The only prophecies that I claim have been fulfilled are the prophecies surrounding the Great Tribulation... and since Jesus, John, and Daniel claim the same thing I think I'm in pretty good company. I will not defend and profoundly disagree with the unScriptural claims made by full Preterists. However, I do embrace the "already" "not yet" premise on a number of Scriptural topics. I believe that there was one and only one Great Tribulation that resulted in the destruction of Jerusalem and the Temple and brought an end to the remnants of the Old Covenant. However, Christians of every age have gone through tribulation. John's specific prophecies about the Beast were fulfilled by Nero Caesar and Rome at the time of John. However, there have been many 'beastly' rulers, organizations, and nations since the time of Nero. Just the other day I was discussing the "already" and "not yet" aspect of the Jesus' Kingdom with my father, and I was throwing out the idea of whether the "already" "not yet" principle might be applicable to the different types of "comings" of Jesus that are mentioned in the NT... Jesus coming in his Kingdom, Jesus coming in Judgement, Jesus Second Coming. DBowling I have been kinda addressing this topic with one hand behind my back because I have not included bible referenes or scripture,but I will.We just moved recently so my bible has been kinda misplaced but I will find it soon and address this alot more from a biblical perspective.As you know I'm respectful in these types of discussions so you need not worry about disrespect,etc.I also want to better address points you've made but more from a biblical perspective. Hopefully we can "Let God be true and every man a liar" which is what I try to do when it comes to interpreting and understanding the bible. I went to Amazon.com to take a quick look at what this book is about. If I understand the reviews of this book correctly, then Hollett is denying that Jesus prophesied the Destruction of Jerusalem in 70 AD. If that is an accurate representation of Hollett's position, then I strongly disagree with his claims. Thanks... I actually found this earlier this evening and watched the first 10 or so minutes. I wanted to see how he dealt with the time frame issue. From what I saw he basically repeats the standard line that "soon" doesn't really mean "soon" and "near" doesn't really mean "near" because since a day is as a 1000 years from God's perspective explicit time indicators are meaningless. To me that is tortured hermeneutics. I didn't get a chance to see how he dealt with "this generation" in Matthew 24:34 yet. From the parts of the video that I watched, I didn't see Hollett really bring anything new to the table. I'd be interested in your impression of who makes a more Scriptural argument... Gentry or Hollett. I did find the section of the video where Hollett talks about "this generation". My response is pretty simple. How does Jesus use the phrase "this generation"? Do a quick study on the context of every time Jesus uses the phrase "this generation". Can you find a single time where Jesus uses the phrase "this generation" that the immediate context does not indicate that Jesus is referring to his contemporary generation? Now let me point out a specific area where I disagree with both Gentry (and NT Wright). I believe that Mat 24:30-31 is a reference to the future Second coming of Jesus instead of a "coming in judgement" on Jerusalem. If you look at my personal outline, you'll notice that I believe Mat 24:30-31 takes place after the "Times of the Gentiles" which takes place after "The Great Tribulation". So I'm still a 'futurist' where Mat 24:30-31 is concerned. DB, I must say I have really enjoyed this thread, as there is so much to chew on. I have mentioned much on the forum of the problems with the various endtimes views, as they all turn upon currently missing info or assumptions to work - meaning that without the missing info, or if one gets a key variable wrong - well, every view is speculation at best. "With no seven year tribulation pending, there's no rapture pending, since all views of the rapture see it as logically having something to do with escaping a great tribulation or separating the Church from Israel." Here is an interesting podcast by Heiser that I came across a while ago. You may or may not have already seen it, but I think Heiser makes a number of good points and I agree with much of what he says. Bit of information overload for me, DB. I'm taking my time looking at these. 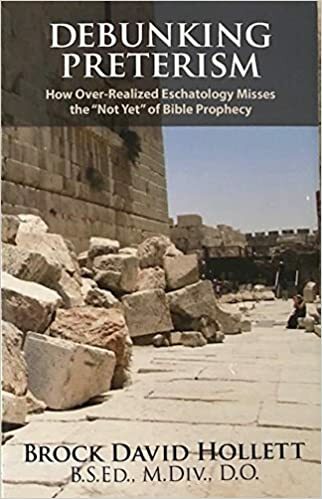 I've been very influenced by Heiser, in that, he doesn't find trying to gain the correct eschatological stance particularly useful, because he sees missing info that is required to be definitive - perhaps why he's not a preterist. Endtimes stuff is my weakest area of knowledge, as with so many conflicting viewpoints amongst people I really respect, are likely adding to my confusion. Certainly, it would appear that Jesus foretold the destruction of the temple and Jerusalem. John certainly seems to have identified the beast, length of time of his oppression, and his innumerated name - but again, are there not parallels to come - as we see such types and repetitive occurrences across the Bible? One thing, per what I've read and the video of Hollett's, he doesn't adequately distinguish between full and partial preterism. In those, he didn't really talk about Nero, Jerusalem's destruction, etc. And some of what he alluded to might mesh with what you state about prophetic meanings applicable (see ongoing) to the past and the present (per your "already" and your "not yet" juxtapositioned opinion). And this is where Heiser seems to counsel Christians to give up on trying to figure this stuff out.